The above info came from Ayame Graves, and was edited by yours truly (contact me). The image came from Wikipedia. Rin Sohma is the horse in the Chinese zodiac. 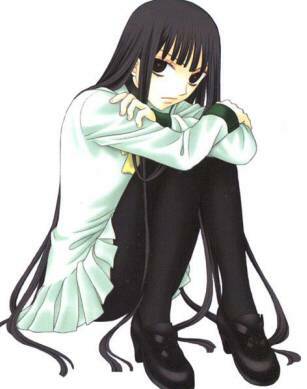 She is very stubborn, yet took the time to fall in love with Hatsuharu Sohma who is the cow. She used to date him, but due to the fact that Akito hurt Rin at one point in time, she didn't want Haru to get hurt too. So she broke up with him. Her parents always devoted her. she now lives with Kagura and her mother. When Haru was young, he used to visit Yuki in his isolation room, which is forbidden. Rin felt that he needed to protect him. Akito's mother, Ren Sohma, tries to get Rin to steal a special box from Akito's room. She is caught and sent into Kyou's room by Akito, who later cuts her hair off. She has also attempted to break the curse, but has not succeeded. She currently goes to a all girls Private school. In a between-chapters panel in Volume 14, it's indicated that she is two years older than Haru. And then in Volume 18 she graduates from high school. Rin only appears in the manga, never in the anime series. The above description came from Danielle and Lana Hiroshi, and was edited by yours truly (contact me).